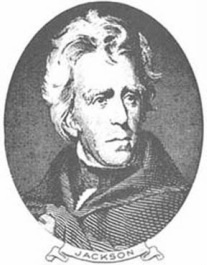 The seventh president of the United States, Andrew Jackson, was considered a hero during his lifetime for his efforts in the Battle for New Orleans during the War of 1812. Jackson was elected in 1829 and served two full terms as president of the United States. Today, Jackson's appearance on the twenty dollar bill is almost ironic as he was behind the dismantling of the Second Bank of the United States. Despite this, Jackson's policies on Native American removal during the mid 1800s could quite possibly be the largest legacy he left behind. The purpose of this website is to provide information about Jackson that is contrary to the views most individuals have of him after studying American history in school. In the educational system historical figures are often glorified and their shortcomings and negative policies are rarely discussed. This webpage will inform readers about Andrew Jackson's polices on Native American removal during the 1830s and will present information as to how these policies negatively affected an enormous number of Native American groups.